In the Disney World Parks: What do you need to know? After all your research and careful planning, you’re finally at Walt Disney World! Your only goal now should be to have a great time, yet you may still feel some anxiety about managing as a Pooh-sized guest. If you are an energetic and agile plus-sized person, you may be less concerned about movement and more apprehensive about fitting. 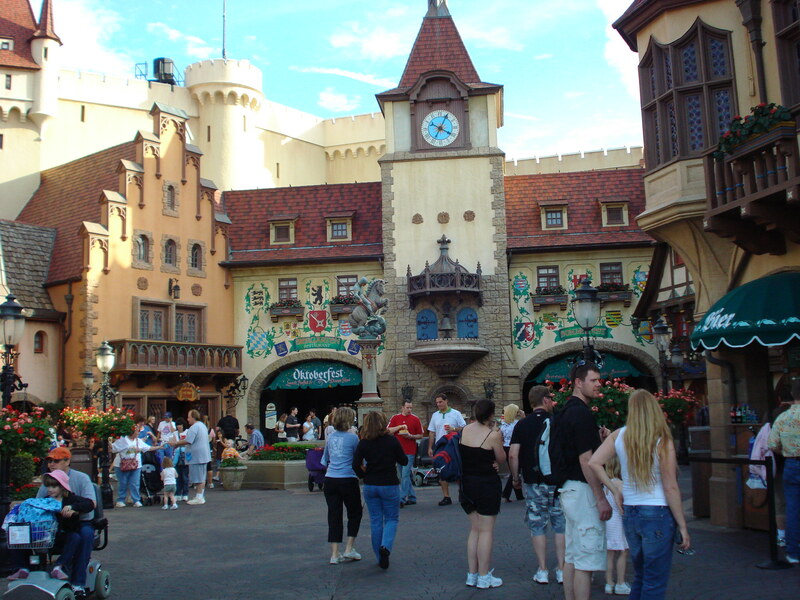 If you have less mobility, you may wonder how easy it will be to get in and out of ride vehicles. We’ll talk about all those things. Disney World Planning for Plus Size (Pooh Size) Guests – Part 1. As we’ve discussed in previous articles, the parks are huge, and you’ll be walking and standing on your feet most of the day. So here are some thriving in the parks. 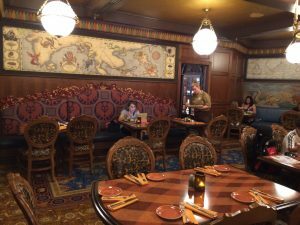 If you’re concerned about the amount of walking, you’ll be happy to know that benches and other seating are fairly plentiful throughout the theme parks and hotels. Usually there are at least a couple benches together in an area, so unless you’re fighting a parade crowd, you should be able to find a space to stop and rest for a bit. be able to find an empty table for a few minutes. Some of them have outdoor seating in addition to the indoor seating. Inside restaurants are all air-conditioned so you’ll be able to cool down if needed. You can also use this as an opportunity to hydrate. You can usually get free ice water. 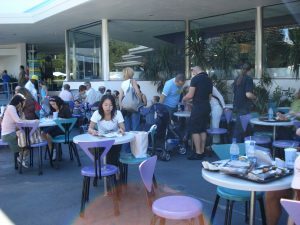 Besides restaurants, in some areas you’ll find indoor, air-conditioned seating, such as the benches inside Innoventions at Epcot. If you want to pace yourself and walk more slowly, just stay to the right side of walkways. People who want to move more quickly should be able to get around you. If you have trouble with ramps and stairs, take them slowly and stop to catch your breath if you need to. If you are walking slowly through a long, empty queue (we should all have this problem! ), you may want to let faster walkers go around you. You’ll feel more comfortable knowing you can take all the time you need without holding anyone else up. After all, if the queue is that empty, you probably won’t have a long wait, anyway. Ah, turnstiles, my old nemesis. Thankfully, the entrance turnstiles and most other turnstiles at WDW have been removed. (The one in the old Haunted Mansion queue was especially evil…how appropriate.) The ones that remain are often more Pooh-friendly, but there are definitely some exceptions in my experience. The Country Bear Jamboree turnstile as well as the turnstile at Carousel of Progress immediately leap to mind. If you know a turnstile isn’t going to work for you, ask a cast member to allow you to enter through the entrance designed for wheelchairs and strollers, and they’ll be happy to help you. These entrances are always available. If you’re not sure you’ll have a problem until you’re facing the turnstile, you can give it a try if you’d prefer. The best way through is to turn to the side and slowly wiggle through while turning. I had a bit of a struggle with the Mickey’s Philharmagic turnstile, but it was doable. that the vast majority of WDW attractions are very, VERY Pooh-friendly. 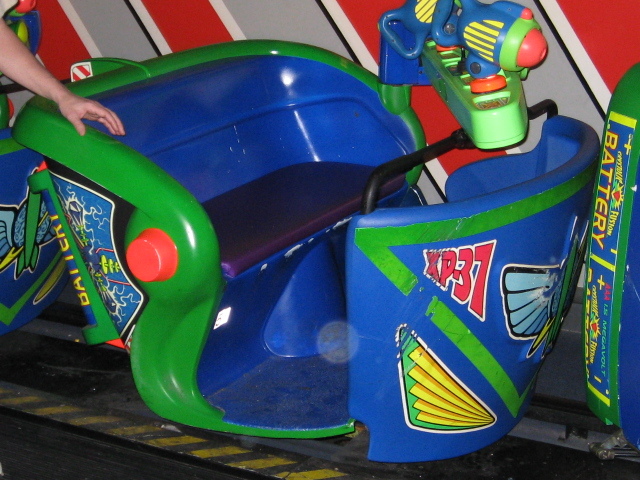 It’s likely that you will fit in most of the ride vehicles no matter what size you are. 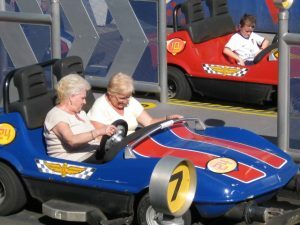 Some of the rides have test vehicles you can try before entering in the queue. Ask a cast member outside the attraction if there is one, and they’ll bring you to it. Worrying about fitting while standing in a line can be nerve-wracking. I remember biting my nails all through the Soarin’ queue, sure that I’d be turned away. I discretely asked a cast member if I’d need a seat belt extension, and he gently assured me that I’d be just fine… and I was. It was the same with Kali River Rapids. However, even following the assurances I was given by a cast member, I was still freaked out about actually fitting on the ride. If you haven’t, read the article called Tips for People of Size at Walt Disney World, where you’ll find additional information on handling different types of ride vehicles. 1. Make special requests for ride car seating when needed. Cast members go through training and will usually make accommodations when possible for Pooh sized guests. Of course you can also make a special request at the time of boarding. For example, you may wish to request that fewer people than are regularly allowed be placed with you in your ride car or row. For example, you may request two rows of two on Pirates of the Caribbean instead of having four people in one row. See the article called Tips for People of Size at Walt Disney World for additional requests you may want to make. 2. Consider who you share your seat with. For a ride with lap bars for the entire car like Big Thunder Mountain, you’ll probably be better off riding with a similar-sized person or alone than with, say, a child. The accommodation of the lap bar for you will allow a smaller rider to slide around or fly up on the drops, which could lead to an injury. 3. Take your time getting into and out of ride vehicles. 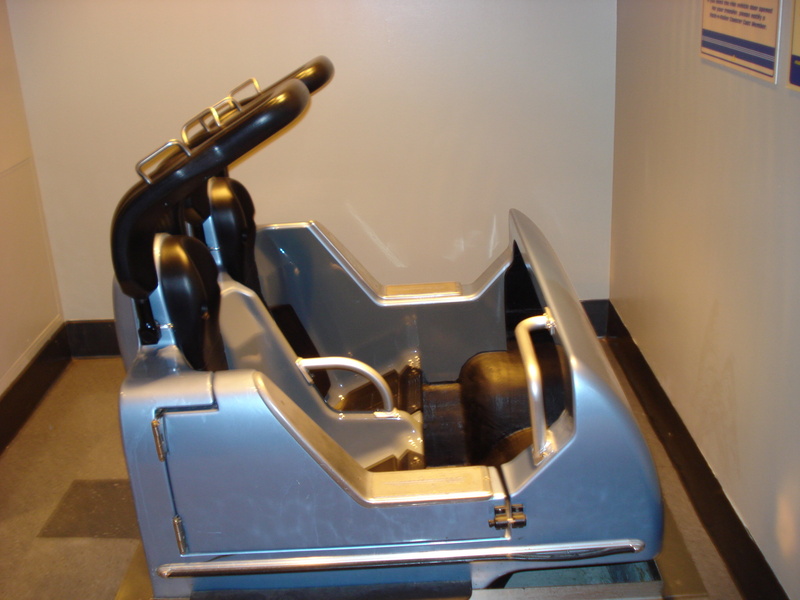 Even for rides that stop so you can load, my tendency is to try to jump into the ride vehicle or seat as quickly as possible to avoid attracting attention, and to have some precious extra seconds to get settled. This is especially the case when I’m in panic mode and afraid that I’m not going to fit, or that the seat belt just isn’t going to fasten. But taking your time can help you get settled even more quickly and smoothly. Remember, the ride isn’t going to start until you’re settled and safely fastened. Important fact: Many of the continuously loading rides can be slowed down or stopped if you need a few extra seconds. Let a cast member know if you need this. those of Test Track or Space Mountain. If you hold up a vehicle for the few extra seconds it takes you to move comfortably, you’ll draw far less attention than you will by falling and hurting yourself. Getting out of low vehicles can be another challenge. Sometimes there is no graceful way, but you may want to start by holding on to the side of the vehicle and pushing or pulling yourself up with your hands as well as your lower body. You may also want to have a family member on standby to lend a helping hand if you need it. In rides with seat belts, pull the seat belt all the way out BEFORE getting into the seat. 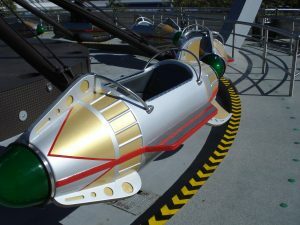 This can really help on rides like Star Tours and Soarin’. If you have a travel companion, have him/her sit on the side where the seat belt fastens and fasten it for you. You can also ask a Cast Member for help if needed. Sometimes the struggle isn’t actually the fit, but being able to see the connector! Again, deal with seat belts calmly. That ride isn’t starting until you’re locked in. I’ve never been a thrill-ride person, so I don’t have much personal insight to offer here. I know that people of size tend to struggle with shoulder harnesses, especially people with larger chests. One tip I’ve read for women with larger chests: try wearing a sports bra that flattens you a bit. Someone wrote that she was turned away from a ride, changed into this type of bra, and was able to make the harness work. Remember that if you’re unable to fit on one ride with a harness, you will want to skip all rides with a harness. These tend to be low, small and fairly uncomfortable for just about anyone. You have one or more people sitting on the same seat, one in front of the other, and you basically sit in each other’s laps. For this type of seating, the largest person should enter first and slide toward the back of the vehicle. Smaller riders can get in next and sit in front of the other person. 7. Make yourself as comfortable as possible before the ride starts, or as the ride pulls out if it leaves quickly. Yay, you’ve discovered that you fit in the ride vehicle… but it’s not exactly the most comfortable thing ever. For example, the handles between the seats on Dinosaur can dig into wide hips. My very least favorite ride vehicle these days is the Small World boat. For me that’s a horrible knee-killer. Try to arrange your body in the most comfortable way possible so you can focus on the enjoyment of the ride. Theater seating can be almost as intimidating to Pooh-sized guests as the ride vehicles. 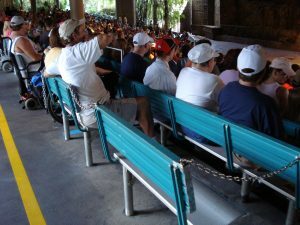 While some theaters have single seats with differing degrees of wideness, some shows such as Country Bear or It’s Tough to Be a Bug have rows of long benches instead. These tend to be easy because you can take all the room you need, and all the time you need to settle in. For single seats, I find that the Pixar Shorts Theater has the widest, most comfortable seats on property. The very worst seats, in my experience, are in the Impressions de France theater in Epcot. I tried to deal with this by sitting on the very edge of the seat, but the extremely narrow arms just drilled into my back. I ended up standing part of the time in the back of the theater. I find that seats for shows such as Mickey’s Philharmagic, Hall of the Presidents, or Muppet Vision 3D fall somewhere in the middle. My trick for dealing with theaters is to wait in the back of the line so I can be sure to have the end of a row. If a theater is quite empty, I may still end up in the middle of the row… just with no strangers sitting beside me. If you’re having difficulty fitting into the seat, push the seat down, sit on the edge of the seat, and wiggle your way back between the arms. It may still not be the most comfortable seat ever, but it should be decent for the short length of the show; most aren’t more than 20 minutes. Most of the restaurants at Disney World have a combination of seating types: booths, half booth/half chair, and tables with chairs. You really can’t request specific seating when you make your advanced dining reservation, but you can make a request when you check in at the restaurant. At tables that have half booths, the tables can be moved away from the booth. Tables can often, but not always, be moved in regular booths, too. If you are shown to a table that seems to be a tight fit, discreetly ask if you can be moved to a different table. It may require a slightly longer wait, but you’ll be grateful to be able to relax and enjoy your meal. Many restaurants seem to have a mix of chairs with and without arms. If your table has only chairs with uncomfortable arms, switch yours with an armless chair at another table. If no empty chairs are in sight, ask the host or server. In my experience, Disney cast members will try their best to make you comfortable as long as you ask politely. I find that there are a few restaurants that are just not Pooh-friendly. For example, the car-style seats at the Sci-Fi Dine-In Theater at Hollywood Studios are fun, but also a very tight fit. However you can request the picnic style tables in the back of the restaurant. Disney transportation can vary in its plus-size friendliness. 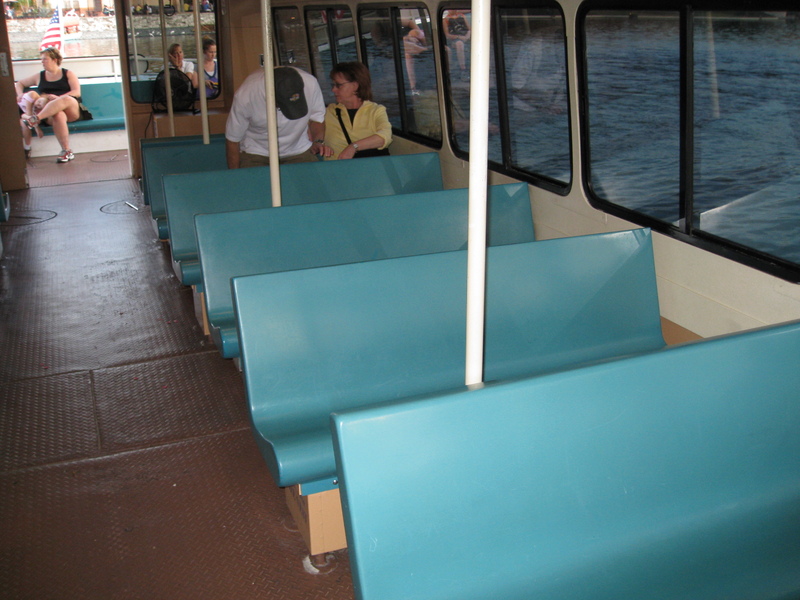 For example, the bench seats on the monorail are comfortable…if you’re lucky enough to get a seat. Otherwise, you’ll be standing holding onto a rail. 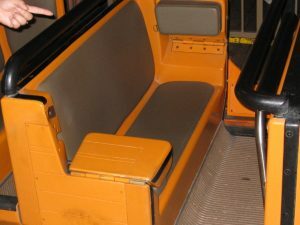 Buses have individual seats that are quite narrow. If you’re a plus-sized guest with a smaller guest in your party, you may want that person next to you to allow some extra wiggle room. If you’re squeamish about sitting scrunched next to strangers, make sure your family members know you’d like a buffer on buses, especially during crowded trips. Have them sit on each side of you. Boats are quite Pooh-friendly with bench seating. As with ride vehicles, be careful about stepping onto and off boats. Just take your time and step cautiously. To solve those problems there’s a store called Torrid. They have a plus size online store that has a great Disney themed clothing line. They carry shirts, dresses, coats, shorts, bathing suits, purses, socks, etc. I put together an image with some samples below. 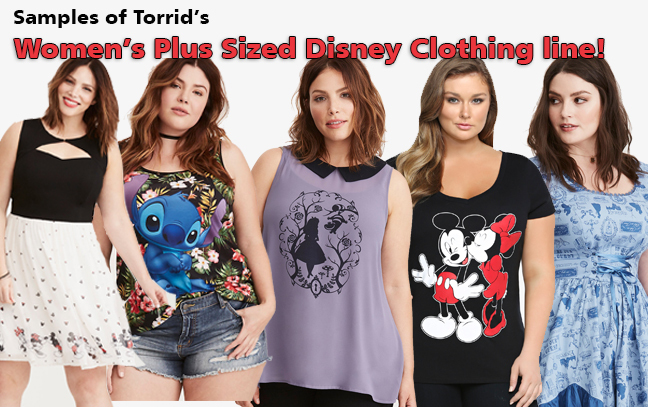 To see Torrid’s Disney clothing line visit here. Unfortunately we haven’t found the same type of store line for men yet, but we’re hoping it will happen eventually! Above all, try to relax and have fun…you’re on Disney vacation! Time and experience have led me to understand a few things I’ll share with you. First, do try to remember that everyone else there is dealing with their own issues…overtired children, sunburn, etc. They’re probably not paying attention to you at all. Second, even if you have a moment of embarrassment that other people witness, try to keep in mind that you will never see any of these people again. So they saw you experience a bad moment…so what? I guarantee that you’ll remember it far longer than they do. Try to put it out of your mind and not let it ruin your fun. You may fear embarrassing your family or friends, but it’s quite likely that the people who love you are more concerned about your physical and emotional comfort, and would not take kindly to any rudeness you might encounter. And once you’ve successfully tried a ride, restaurant, or other activity that filled you with apprehension, you’ll begin to relax and know that you can have a great time at Walt Disney World – at any size. Do you have some opinions and experiences you can share? Please share your tips, as well as your good and bad experiences below in the comment section.